Constitutional symptoms (such as weight loss, fatigue, etc. ), gout, renal stones, hepatomegaly are often present at diagnosis, but asymptomatic disease also occurs. Patients may present with high counts or cytopenias, and occasional blasts are often reported on blood film. The survival of patients with overt PMF is significantly less than for patients with ET or PV at between 3–7 years. 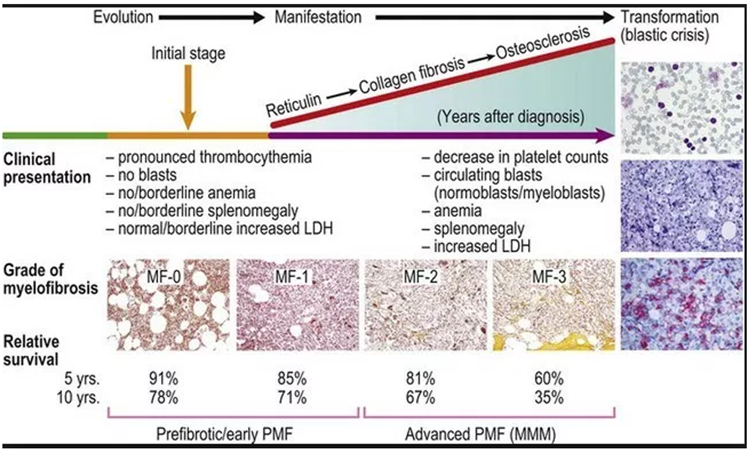 The natural history of PMF is demonstrated in the figure below (adapted from 2016 WHO figures). Treatment has historically been with cytoreductive agents or interferon. JAK2 inhibitors are not yet funded in New Zealand, but have been shown to significantly improve symptoms, transfusion burden, splenomegaly, and possibly to prolong survival in patients with PMF, however, allogeneic transplantation remains the only treatment which offers the hope of cure.